By GEORGE LEE DOWD, JR.
EINSTEIN’S theory of relativity receives a new test in the wilds of Sumatra in the Dutch East Indies on May 9, when leading astronomers of Europe and America study and photograph a remarkable five-minute total eclipse of the sun, for which they will have journeyed halfway around the world. The duration of the eclipse, and the fact that this island off the Malay Peninsula lies directly in its path, offer an unusual opportunity for scientific observation. The average eclipse lasts only from one to four minutes, and the longest possible duration of a total eclipse for a single observer is seven minutes and fifty-eight seconds. work with the speed and efficiency of mechanics changing the tire of a racing auto. If it rains or is cloudy during those five minutes, a quarter of a year of preparation and travel will be lost by the expeditions to Sumatra. That island will not see another total eclipse until 1988. During this miniature midnight, the stars in the neighborhood of the sun will be photographed. To test the Einstein theory, the same stars will be photographed again at night. Their positions in the two photographs will be compared. If they appear to be in a different position in the eclipse photograph, it will indicate that the light rays were bent out of their courses in passing the sun, in accordance with the theory of the famous German scientist. 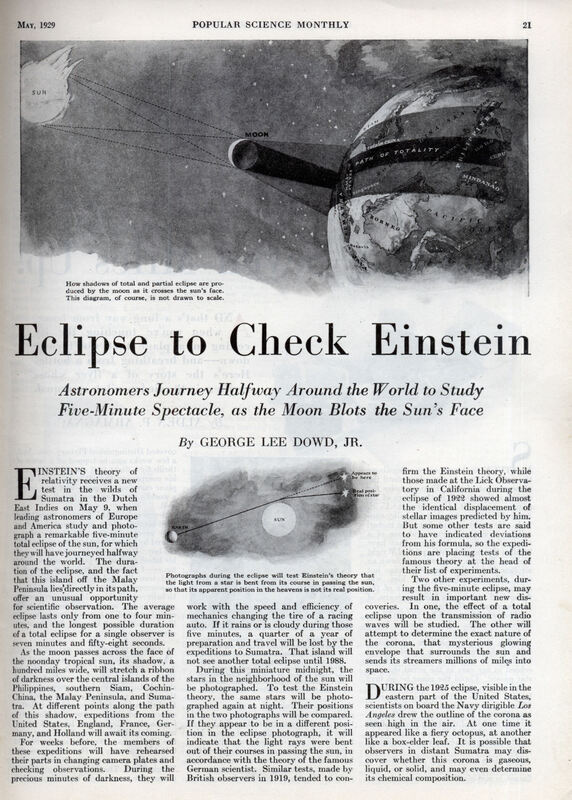 Similar tests, made by British observers in 1919, tended to confirm the Einstein theory, while those made at the Lick Observatory in California during the eclipse of 1922 showed almost the identical displacement of stellar images predicted by him. 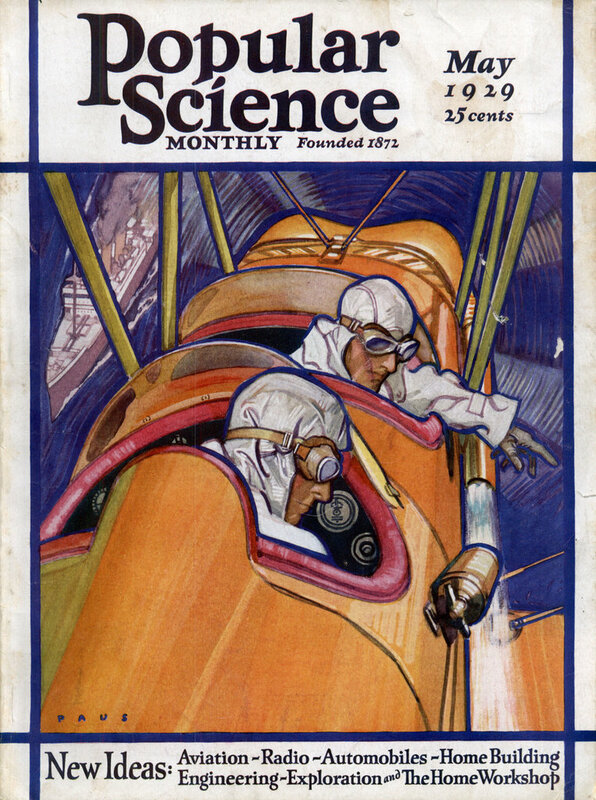 But some other tests are said to have indicated deviations from his formula, so the expeditions are placing tests of the famous theory at the head of their list of experiments. Two other experiments, during the five-minute eclipse, may result in important new discoveries. In one, the effect of a total eclipse upon the transmission of radio waves will be studied. The other will attempt to determine the exact nature of the corona, that mysterious glowing envelope that surrounds the sun and sends its streamers millions of miles into space. DURING the 1925 eclipse, visible in the eastern part of the United States, scientists on board the Navy dirigible Los Angeles drew the outline of the corona as seen high in the air. At one time it appeared like a fiery octopus, at another like a box-elder leaf. It is possible that observers in distant Sumatra may discover whether this corona is gaseous, liquid, or solid, and may even determine its chemical composition. I bet you think this song is about you, don’t you? No, you’re thinking of the Nova Scotia expedition. How vain!